Enjoy outdoor fun and protect yourself and your family from injuries. Summer is the perfect time for fun activities with your family and friends: swimming, camping, outdoor games, fireworks, cookouts, and more. Sharing great summer experiences with your loved ones can create wonderful memories that last a lifetime. That's why safety is so important during the summer months. We've collected the best safety tips around to help you ensure that your summertime activities are free of accidents and injuries. Never leave children unsupervised in a pool area. Always have rescue equipment and a phone near the pool. If a child is missing, check the pool and nearby areas first. Drain baby pools after each use to prevent drowning. Never dive or slide headfirst into a pool less than five feet deep. Surround pools with a gate or fence four feet or higher. Pool gates and fences need child proof latches. 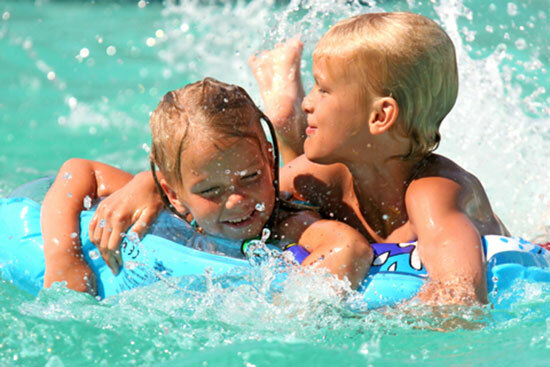 Read more about summer safety tips for swimming pools. Never allow young children to play with fireworks. Sparklers injure children under five most often. Never place your body over fireworks when lighting fuses. Move back to a safe distance immediately after lighting. Never re-light fireworks that have not fully functioned. Keep a bucket of water or hose near in case of fires. Never shoot off fireworks in metal or glass containers. Read more about summer safety tips for fireworks. Enjoy your summer celebrations, but never drink and drive. Watch out for increased road construction and work zones. Never leave pets or children in the car, especially in the sun. Never let children ride bicycles that are too big for them. Prevent engine overheating by inspecting hoses and belts. Always wear a bicycle helmet, no matter how far you ride. Motorcycle helmets reduce the risk of brain injury by 67%. Read more about summer safety tips for motorcycle riders. Children younger than six should not use a trampoline. Children should remain in the center while bouncing. Limit trampoline use to one person on at a time. Read more about summer safety tips for trampolines.